Twice-baked potatoes have long been a favorite of mine. Usually served as part of a steak dinner, they almost always overshadow the meat for me. However, up until a few years ago, I never even would though about stuffing them with anything other than cheese, bacon, and scallions. Times have definitely changed though, because now I love experimenting - chipotle-cheddar stuffed potatoes, twice-baked sweet potatoes stuffed with gruyere, sage, and brown butter....not to mention the variations that I love but have never shared on here - pulled pork stuffed sweet potatoes, broccoli-cheddar stuffed potatoes... I seriously think I could just live off of twice-baked potatoes. 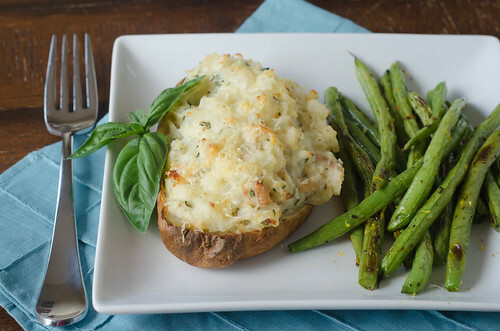 So when my friend Jessica posted these twice-baked potatoes stuffed with chicken and basil, I knew we would love them. I have a bad habit of not thoroughly reading the directions and ingredient lists before doing my shopping, so I didn't have everything that I needed. But I improvised, and we still ended up with a fabulous meal. 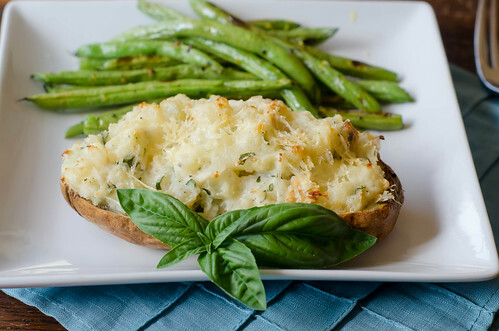 These potatoes are stuffed with shredded chicken, lots of basil, parmesan, and ricotta cheese. They are just as good as you might think - creamy, cheesy, and majorly comforting, with a hit of freshness from the basil. I served these with some lemon-garlic roasted green beans, and it made for a wonderful summer meal. Preheat the oven to 425. Rub the potatoes with olive oil and sprinkle with salt. Prick a few times with a fork, and arrange them on a baking sheet. Bake until tender and cooked through, about an hour to an hour and a half. Remove from oven and allow to cool slightly. As the potatoes are cooling, heat 1 tablespoon of olive oil in a small skillet over medium heat. Add the onion and cook until softened, stirring often, 5-7 minutes. Add the garlic and cook until fragrant, about one minute. Remove from heat. When the potatoes are cool enough to handle, slice them in half lengthwise, and use a spoon to scoop the flesh into a medium bowl, being careful not to tear the outside. Return the shells to the baking sheet. Mash the potato until mostly smooth, then mix in the sautéed onions and garlic, ricotta cheese, chicken broth, basil, 1/2 cup parmesan cheese, and salt and pepper. If the mixture seems too dry, add a little more broth as needed. Fold in the shredded chicken. Taste and season with additional salt and pepper if necessary. Divide the mixture evenly among the potato shells, and sprinkle with the remaining parmesan cheese. Return to the oven and cook 15-20 minutes, or until the filling is heated through and the tops are beginning to brown. Turn on the broiler for the last few minutes if the tops aren't browning. Mmm, how did these escape my menu planning from Jessica's blog?? These look fantastic and i almost have everything for this, too!! Adding it to my must-eat list!! Yum!! I love that you added ricotta!! I definitely need to try it like that. So glad you liked them! Yours look delicious! any thoughts on how this might freeze? Josie this sounds and looks amazing. I love the idea of incorporating shredded chicken into the potato! Hola Josie, I have been quietly reading you since we met in Charleston. I will surely try these soon! I made your cilantro salmon burgers last week and everyone here loved them! do you mind if I translate the recipe for my blog? I'll be honest...I don't think I've ever eaten a stuffed/twice-baked potato. They just weren't my mom's kinda thing so we never had them as kids...and now I've never had one as an adult. Sadness. I love the mixing in of basil into these...it must make them really pop with summer goodness. So decadennnnnt! Bring on the cheese! These sound great. Is the recipe for your green beans on this site or could you share? Our garden is full of great green beans right now and these sound perfect for my family. This looks so good! Never would have thought to use chicken. Anonymous, I haven't tried it myself, but I think they would freeze just fine. I would just prep and fully assemble, freeze them on a cookie sheet, then wrap in plastic wrap and store in a big ziploc bag. Or maybe just line them in a single layer in a casserole dish, cover, and freeze. Ana, of course I don't mind! Hope you are doing well!! I do not have the recipe for the green beans posted, but all I did was toss them with olive oil, lemon zest and juice, garlic powder, and s&p and roast at 425 10-15 minutes. Then I added another squeeze of lemon juice before serving. This is heaven to me! The fact that it has lots of cheese and potatoes...awesomeness...! LOL! These were great! Didn't have any ricotta, so I used a little cream cheese. My husband loved them. Thanks! These are great! I used low-fat ricotta, so I think that these were pretty healthy. I am a huge fan of twice-baked potatoes, but I normally don't make them because they involve unhealthy things like sour cream and bacon, so this was a nice change. Thank you for sharing such a delicious!